If you want to be restored as an energized, non-diabetic with perfect blood pressure, no inflammatory pain, no digestive health issues and no excess weight….. you should try my recommendations below. You will notice some improvements immediately. Others improvements will take a few months. Early breakfast ……5 tablespoons of Original Hemp Hearts (TM) (2oz or 55g) with a salad of spinach, tomato, cucumber, radish, celery, carrot, garlic, cayenne pepper, fresh lemon….no oil…(drink water or tea with it). Protein is very important for ensuring that ALL of your tissues become and remain healthy. Those who are overweight can lose weight while restoring tissue health …..by using Flakes instead of Hearts for breakfast most days…and by limiting themselves to one or two servings of my hemp products (usually Flakes) with vegetables each day….and nothing else. If you are too lazy to make real salads…you could prepare few paper bowls of ingredients every evening for the next day:one bowl with baby carrots….one with tomato slices….one with small radishes….one with celery…one with cucumber slices. Then you could make a dip with mashed, ripe avocado and lemon or lime and other spices. Every time you eat….dip the vegetable pieces in the avocado mix and then in the Hearts or Flakes….then consume. Use any extra lemon or lime in your tea. Square Meal Desserts (TM) are my way of offering you Hemp Hearts Protein Flakes (TM) salads that are so tasty and so effective that you will use them whenever you are bored with the Flakes and Vegetables above….. Most late onset health problems result because we have been discouraged from consuming significant quantities of good protein.….protein that is the equivalent of mothers’ milk. 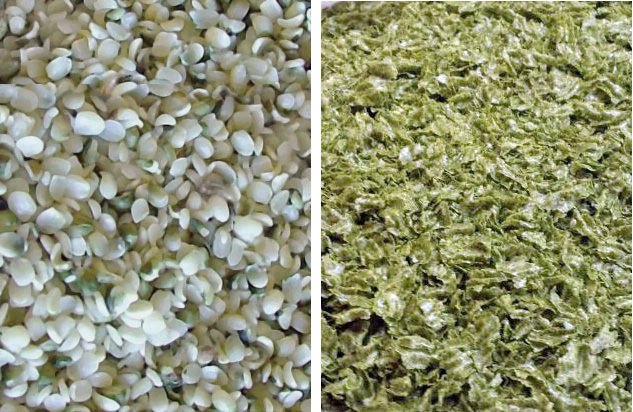 – Hemp Hearts Protein Flakes (TM) (double the protein of the Original Hemp Hearts (TM) because they contain much less fat). (A) Full cases of 9 x 454g (one pound) packages of either product…. Original Hemp HeartsTM and Hemp Hearts Protein FlakesTM …..totaling 9 containers per shipment. This offer is for those who agree to pay us 12.00 per pound for PRODUCT SUPPORT for our continuous guidance relative to the health program above. Those who do not receive any benefit CAN REQUEST THEIR MONEY BACK….but the health benefits are only guaranteed it the program is followed precisely. and Your local telephone number for the courier.